Little falls on the creek in the Taughannock Falls State Park near Ithaca, New York. Nikon D700/Tokina 11-16mm, 0.6s, f/20, ISO 200, EV 0, 15mm focal length. I have shown you plenty of photos of Taughannock Falls over the last year. At 215 feet (65.5m), it is one of the tallest waterfalls east of the Mississippi River. The gorge the falls created over centuries contains the creek with several smaller water drops like this one. A mere 1.5 feet (0.45m) tall, it still can erode through rock over time. I know it is now March and Karma’s Photo Hunt for February is over. I could not resist taking this photo of an unusually shaped piece of ice I found along the Taughannock Falls State Park gorge trail. 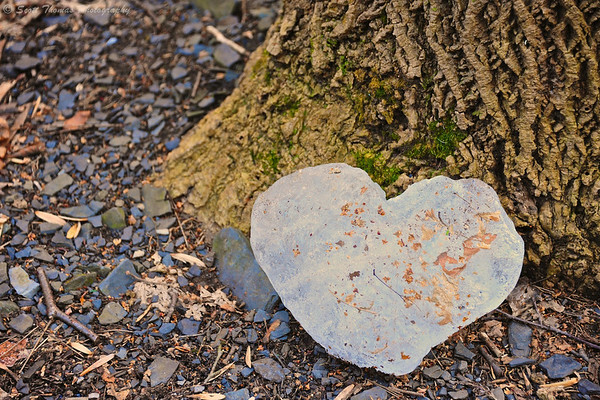 Heart shaped ice formation found at the base of a tree in the Taughannock Falls State Park near Ithaca, New York. Nikon D700/28-300VR, 1/60s, f/5.6, ISO 1250, EV 0, 122mm focal length. Wonder if this ice was naturally shaped or had the help of a love struct human. 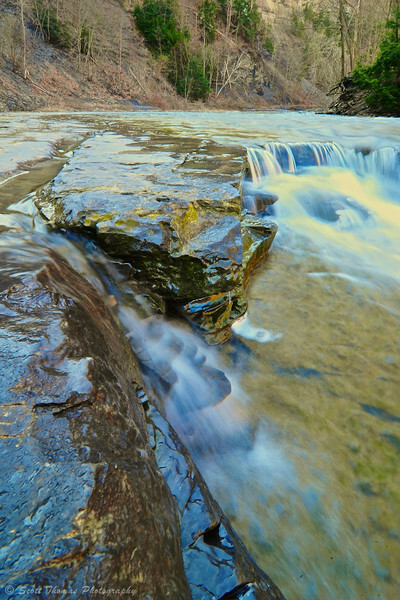 This entry was posted in Nature, Weekly View and tagged bed, blur, creek, gorge, motion, new york, nikon D700, state park, taughannock falls, tokina 11-16mm, water, waterfall. Bookmark the permalink. Thanks, Jona. In this case, the stone will melt. Fleeting as a young love. It pays to look down! Heart shaped heart! **Follow our hearts** that’s what it’s saying. I stared at the energy in the waterfall for some time. It was captured beautifully, Scott. The little falls had a lot of energy as it flowed and bubbled endlessly. I got a little dirty taking it but that’s the fun of photographing nature. Aw, that heart would have been just perfect for the photo hunt! Neat! Very pretty shot of the short falls! Thanks, Terry. We are coming into waterfall season though, without the snow melt, not sure what to expect.